Run the test by calling each function against the test table. I made the calls as separate batches to the server so that I can grab some execution query statistics afterwards. I ran the test 10 times to get a satisfactory sample set for the performance test. I measured performance by utilizing the execution query statistics. You can not easily do this any other way. The execution plan and IO statistics for scalar value functions are nearly useless. Here is the result. 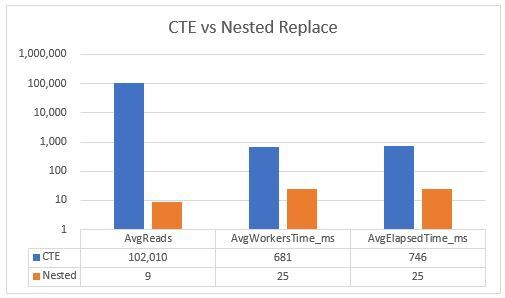 As you can see, the nested replace function performs much better than the CTE. I hypothesized this would be the case, but it’s nice to be able to prove it so you can feel comfortable moving forward with a solution.